Electric cars are great, in theory. They may help you reduce your personal travel costs, carbon footprint and emissions. However, their range (or distance they can drive on a single charge) may be underwhelming for new customers. The manufacturers of these fossil fuel-free vehicles claim that the range of their electric cars improves every product cycle; however, real-world tests may find that it falls short of maximum ranges on paper. Range depends heavily on the capacity of the batteries incorporated into electric cars. Unfortunately, the structure and function of conventional vehicular batteries is not efficient enough for the job at hand, and there are few feasible alternatives at present. Lately, there’s been some coverage on interesting research that may bring wireless, mid-range charging for electric cars to fruition. The resulting technology allows coils to transmit current across space, even if one is moving in relation to another. The scientists behind this breakthrough think it can be optimised so that it can service whole fleets of electric cars with appropriate receivers that run on roads with inbuilt transmitters. Therefore, this putative new generation of cars would charge as they drive, thus eliminating the problem of range altogether. However, should this proposition ever come to be a reality, it is still years or possibly even decades away. Therefore, battery technology for cars will need to become much more effective and efficient in the meantime. The batteries in modern electric cars are a matrix of cells that are laid out side by side in ‘modules’, which leads to a sparse, expansive structure. This is because each individual cell needs to be connected to the car, and also to sensors so that they can be monitored by the vehicle’s computer. This also renders the battery’s cooling and housing solutions complex and heavy. Therefore, the battery as a whole takes up a lot of space, which impacts its size and capacity. Some researchers claim that the complicated cell, housing and circuitry take up half the space that is theoretically available to a car’s battery. A more ideal solution would be a power-pack with denser cells that can connect to the rest of a car using fewer cables or connectors. A team at the Fraunhofer Institut für Keramische Technologien und Systeme (IKTS), IAV Automotive Engineering and ThyssenKrupp System Engineering may have solved these problems with their new battery prototype. It involves changing the cellular layout, so that the individual subunits are arranged in stacks rather than a layer. This increases the surface area of the battery; in other words, more cells can be packed into a given area compared to a conventional electric car power-pack. The entire stack can also connect directly, thus negating the need for space- and resource-intensive battery housing. The new battery, named EMBATT by the IKTS and its governmental funding partners who hope to commercialise the breakthrough it represents, also has a novel and innovative electrode, composed of a metallic strip coated with ceramics on both sides. This confers the property of bipolarity – in other words, one surface of a strip can become a cathode, and the opposite side the anode. The ceramic coating also acts to store the energy within the battery. 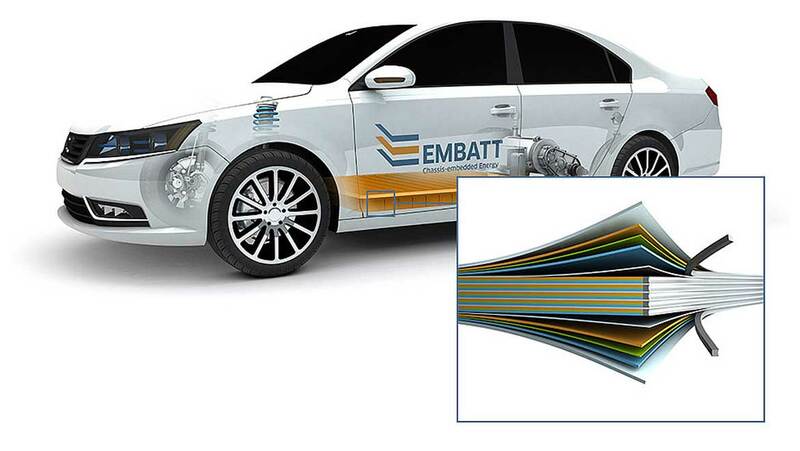 All in all, the team behind EMBATT claim that their new battery could generate a range of up to 1000km when installed in a compatible vehicle. IKTS is mainly responsible for developing the electrode technology, while ThyssenKrupp has been tasked with making the batteries. When this process has reached the production stage, IAV may have completed their task of investigating methods to integrate EMBATT into electric vehicles. Dr. Mareike Wolter of the IKTS claims that the production process for the battery’s strips has already been worked out. The ceramic – in powder form – is mixed with molecular conductors and certain polymers to create a suspension, which is used to coat the metallic strips. Wolter maintains that this method reduces the difficulty of manufacturing the overall battery. This new electrode structure should also save on space, energy losses and battery wear over time. Dr. Wolter also says that the team are ready to scale EMBATT up to full-sized car batteries. The science and engineering partnership behind EMBATT estimate that their new style of battery will be ready for testing as a vehicular power pack in the next decade. Until then, we can hope that their project succeeds in bringing us longer-lasting batteries for electric cars. EMBATT is being funded by federal and specialty banking bodies in Germany, thus potentially increasing the chances that the project will be supported for as long as it needs. An increase to about 1000km in range for these vehicles may help them appear much more feasible and attractive for more potential drivers. An extended range would also make electric cars much more practical in real life, particularly for people in smaller countries such as Ireland. On the other hand, larger-capacity electric car batteries may also have some disadvantages. They may take longer to charge; as the cycles associated with current electric cars can last hours, this could be a significant drawback. On the other hand, the new ceramic technology may also offer scope for optimised charging times, based on the putative improvements in energy storage. In summary, EMBATT incorporates dipolar electrodes into batteries intended for electric vehicles, thus optimising the capacity-to-space ratio in these power packs. This could increase the range of electricity-powered driving to as much as 1000km per charge. This breakthrough could drive the more widespread uptake of electric cars, and make their use more energy-efficient and economical. EMBATT will not be ready until 2020 at the earliest. However, its advent could encourage many more drivers to go electric, reduce their emissions and live greener lives in the near future.